Seoul is one of the world’s largest cities with a population of over 10 million. A leader in information technology, Seoul is also one of the world’s most digitally-connected cities. While Seoul has the greatest number of skyscrapers in Asia, it remains a city of contrasts—among the modern skyscrapers, 14th century palaces and temples co-exist. Students can take in the views of the surrounding mountains from Seoul’s numerous gardens and parks or from the top of the Seoul Tower, shop at high-tech shopping centers or traditional markets, or attend one of the city’s cultural festivals or a rock concert at the Olympic Stadium. There are various performing arts venues and over 100 museums in the city as well as numerous restaurants in which you may sample traditional Korean and Asian dishes as well as cuisine from around the world. Hobart and William Smith Colleges maintain an exchange program with Yonsei University, Korea's oldest university. Established in 1885 as a Christian institution of higher learning, Yonsei’s campus is set on 250 wooded acres in western Seoul, 20 minutes from downtown. University enrollment is over 38,000 students and about 400-500 international students attend Yonsei from partner universities in 45 countries. The standard course load at Yonsei is four courses. Exchange students may choose from over 60 courses taught in English by the international undergraduate division, Underwood International College. Native speakers of Korean are also welcome to elect other courses offered by the university provided that reading and writing skills are at an appropriate level. To see courses, click here. Click on course “catalog and syllabus”. In the pull-down boxes choose for the first box “undergraduate courses”, for the 2nd box “Underwood International College”, and for the 3rd box choose the appropriate division or department at Underwood. For semester, choose 1st semester for the spring semester and 2nd semester for the fall semester. Click on the magnifying glass after the 3rd box to start the search. Once you find a course you want to look at, click next to the course code on the blue arrow for a course description and the purple arrow for a syllabus. Due to the wide range of courses offered at Yonsei University, this program can accommodate students from a variety of disciplines. Curricular strengths at Yonsei include Asian studies, economics and business, international relations, religious studies, and sociology. This program is open to juniors and seniors in good social and academic standing who have a minimum GPA of 3.0. Exchange opportunities depend on the availability of slots at the host institution. Korea is a socially conservative country and all students must demonstrate a track record of responsible, culturally appropriate behavior. Due to the challenging nature of study abroad, student academic and disciplinary records will be carefully screened. Note: due to the timing of the academic calendar at Yonsei University, seniors participating in the spring semester will not be able to return in time for commencement on the HWS campus. Students will live in International House, a campus residence hall. All rooms are doubles with twin beds and there are separate wings for men and women. Both Korean and international students live in the dorm, although the primary language is English. Every room has central heating and an air conditioner and is equipped with LAN connections for Internet use. There are shared refrigerators for student use, lounge areas, study areas, a recreation area, a lecture room, a computer room, and laundry facilities. Students can purchase meals in one of the college cafeterias or in one of the many nearby restaurants. Many meals cost as little as the equivalent of US$4. Most students can eat adequately with a food budget of around US$400 per month. The Korea program is not a “study abroad program” in the traditional sense in that HWS students will be directly enrolled at the university. 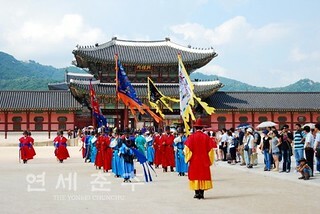 While there will not be excursions throughout the semester designed specifically for HWS students, when you arrive in Korea you will have an orientation which will include a campus tour, an discussion of academic and residence hall policies, and an overview of the city of Seoul and how to get around safely and efficiently. You will be briefed on special opportunities for international students such as doing a weekend homestay experience, joining student clubs, and having a Korean “buddy”. The “buddy program” matches new incoming exchange students with Yonsei University students, to help newly arrived students settle in and make the transition to life in Korea. Students are encouraged to seek out opportunities to immerse themselves in campus life and the local culture. Students will be charged standard HWS tuition and fees and a $600 administrative fee. This will cover tuition for a four-course semester, health insurance, and the orientation program. Note that no room or board charge is included. Students will pay dorm fees directly to Yonsei University and should plan to bring their board fee to cover meal expenses throughout the program. We estimate room fees at $1750-$1900 for the semester. While meal expenses will vary according to individual tastes, we estimate $1750-$1950 should be sufficient for most students. Additional expenses not covered include airfare, books, and personal expenses (laundry, entertainment, ground transportation and independent travel). We estimate airfare for this program at $1400—$1600 from the East Coast and books at $150-$250. It is difficult to give an accurate estimate of personal expenses because student spending habits differ considerably. We would suggest a minimum of $1300 above and beyond meal expenses. However, students on a tight budget should be able to manage with less. If you are concerned about finances, we strongly encourage you to talk to the CGE staff who can offer information and advice based on your specific situation.